The Chemical Engineering curriculum aims to develop knowledge and skills that will prepare students for leadership in the practice of the chemical engineering profession. Besides providing a firm foundation in the basic engineering and physical sciences, with non-technical courses in arts and management. Civil Engineering has grown into a diverse branch of engineering which involve various fields of specialization such as structural engineering, construction, highway engineering, hydraulics engineering, foundation engineering, and water resources engineering, among others. The Department of Civil Engineering is consistently recognized by the Commission on Higher Education as a Center of Development. The Department of Electronics and Communications Engineering envisions the ECE and CpE graduate as a competent and ethical professional in the areas of electronics system, communications system, digital signal processing, computing and information technology and embedded system. Industrial Engineering is the disciplined, systematic, and holistic approach on the management of human resources, equipment, materials, capital, energy, information, and its environment. It covers three major areas of study namely; Production and Operations Management, Operations Research or Management Science, and Human Factors Engineering or Ergonomics. The Department of Industrial Engineering is recognized by the Commission on Higher Education (CHED) as a Center of Development. The first of its kind in the Philippines, Manufacturing Engineering and Management is an interdisciplinary engineering course that integrates mechanical engineering, electronics engineering, computer studies and modern management into a single five-year degree program that includes one year of on-the-job training in manufacturing companies. 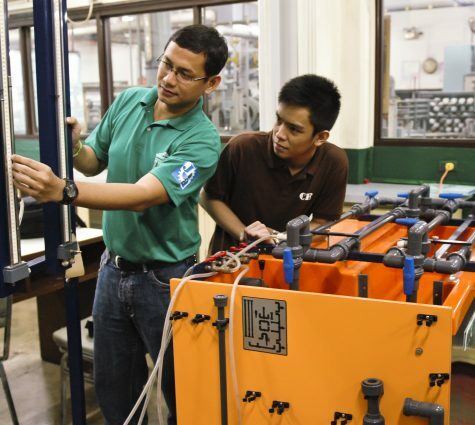 The Mechanical Engineering program in DLSU is among the most advanced and up-to-date ME programs in the country in line with the demands of the information age. It is fully complemented by a highly effective faculty, up-to-date teaching facilities – laboratory, computers and Internet, and library facilities, research orientation through the thesis program. The Commission on Higher Education (CHED) bestowed the Center of Excellence award on this program for two straight years.